Are you looking for a fast and affordable way to improve the interior atmosphere of your home? There is a world of interior design possibilities resting just beneath your feet. Adding beautiful tile flooring to your home can significantly increase its value and can serve as an attractive foundation for any room. From sleek and modern, to rich and classic, we offer a wide selection of floor tiles that give your living space the exact look and feel to complete your interior design vision. Though each of our floor tiles offers distinct characteristics, all of our options offer versatility and longevity provided that they are properly maintained. When making an investment in your home like new flooring, we want to make sure you are completely confident in your decision. You can count on our team of design specialists to make sure that all of your flooring needs are met, including professional tile flooring installation. Upgrading your flooring is an easy way to accomplish a transformative look throughout your home or business. New floors cover such a large amount of space that they make a significant style statement. For easy care and many diverse design choices, peruse our collections of ceramic tile. This versatile flooring material enhances the overall aesthetic appeal of any room and contributes to its atmosphere. 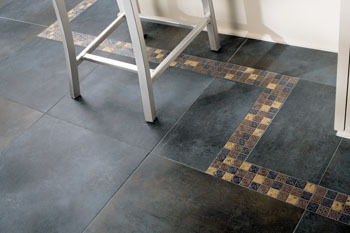 Ceramic tile is an ideal flooring material if you want to have a durable low-maintenance floor. These tiles are composed of a combination of natural clay, water, and minerals that is hardened by oven fire and coated with a protective glaze to make for an extremely durable end product. Due to their hardiness, ceramic tiles are an excellent choice for areas of the home that experience a large amount of foot traffic such as the kitchen. They provide the look and feel of real stone and are impervious to moisture penetration, making them an ideal choice for bathroom flooring as well. Our showroom-quality ceramic tiles stand the test of time against traditional wear and tear and maintain their visual appeal with minimal cleaning. With routine sweeping, vacuuming or damp mopping you can keep your selection looking great for years to come. Stylish and durable porcelain tile is hard-wearing and can hold its appearance with little maintenance. These tiles are strong and extremely resistant to stains, scratching, and cracking, making them a great choice for areas of high traffic. Our porcelain tiles are made from a fine, dense clay and are fired at high temperatures to ensure their sturdiness. They make great additions to flooring designs in residential and commercial settings due to their durability, elegance, and scratch resistance. Our porcelain selections can be used in both indoor and outdoor applications. Many of our customers choose from our porcelain selections because of their cross-setting capabilities. No matter if you plan to renovate a formal setting or a casual one, our flooring specialists are happy to help you find a selection that fits your needs. Though slate tile lends itself to several areas of home improvement, its benefits are usually realized in flooring applications. Slate tile floor is an investment in your home that lasts, adding value and a smooth, soft texture that is comfortable to walk upon. It provides a natural look that is easy to maintain and can be customized based on a number of applicable finishes, making it suitable for several rooms in your home. Slate flooring retains heat evenly, which makes it ideal for homes in colder climates or for spa-styled bathrooms. Our slate flooring comes in a wide variety of colors and finishes that can help you achieve the beautiful flooring you’ve always wanted. Our professionals help educate you about the many slate flooring solutions available for your home. Our commitment to helping you make your interior design dream a reality doesn't end after you've made your selection. Our team is dedicated to earning your complete satisfaction, from consultation to installation. We offer professional tile flooring installation from skilled, experienced installers as one of our comprehensive flooring services. All of our products are backed by wear, fade and stain warranties that can last up to 25 years, so you can rest assured that you are getting a quality installation from a capable team. Whether you are in need of a floor replacement or want to add the finishing touches to a new construction, our specialists are here to help you give your home the look you’ve always wanted. Start your next project with our devoted tile flooring specialists. Contact us today at <PHONE> to book your free in-home consultation concerning tile flooring for your home or office. We are located in Decatur, IL, and proudly serve Forsyth, Mt. Zion, Macon, Solomon, and the surrounding areas.